Mojo Magazine, every month, asks various celebrities what their favorite Sunday morning record is. In case they call the Washerman’s Dog, I’ll be ready. I would then refer them to a 1968 Indian LP called Khayal by Ustad Amir Khan, which I share with you tonight. There are many who feel that Amir Khan was a man ahead of his times, far more sophisticated in thought and expression than musicians before and after him. In his lifetime he became an icon for purists, and the large number of vocalists who have tried to follow his vocalism, is testimony to his genius. In the 30 odd years since his death, his music continues to command a large following among khayaliyas. 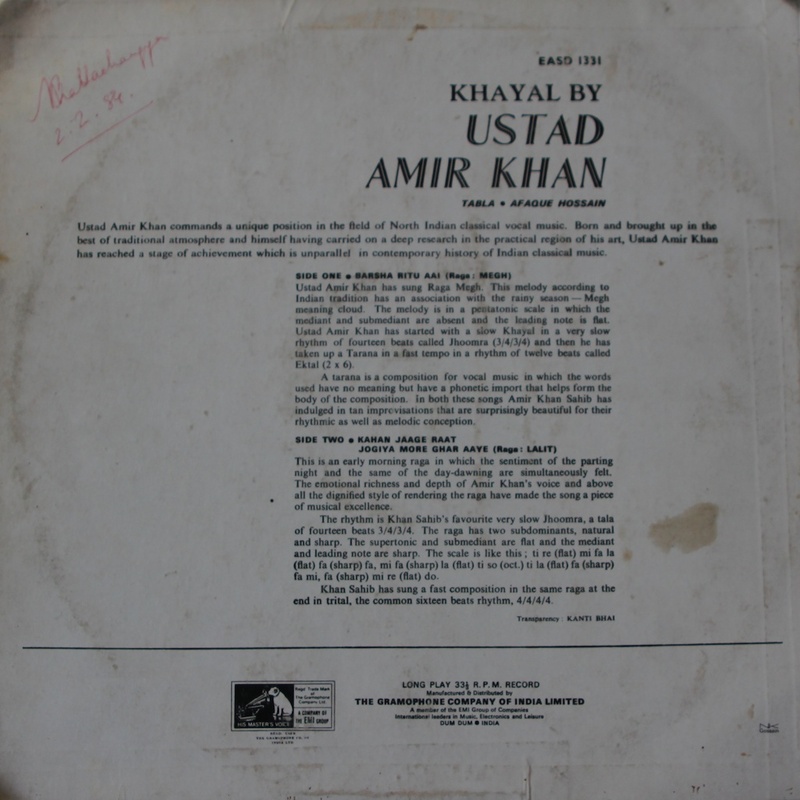 Ustad Amir Khan`s serene, tranquil and contemplative music rested on an incredibly fertile intellect. Born in a family of musicians in Indore in 1912, he was brought up in the rich musical atmosphere of Indore, where the Royal court had appreciable patronage for Hindustani classical vocal music. Amir Khan`s chief mentor was his father, Ustad Shahmir Khan. However, his formative years saw the young Amir Khan experiencing a steadily growing interest in the gayaki of Ustad Rajab Ali Khan, whose mehfils were frequent in town and also that of the other Kirana giant, Ustad Abdul Waheed Khan. 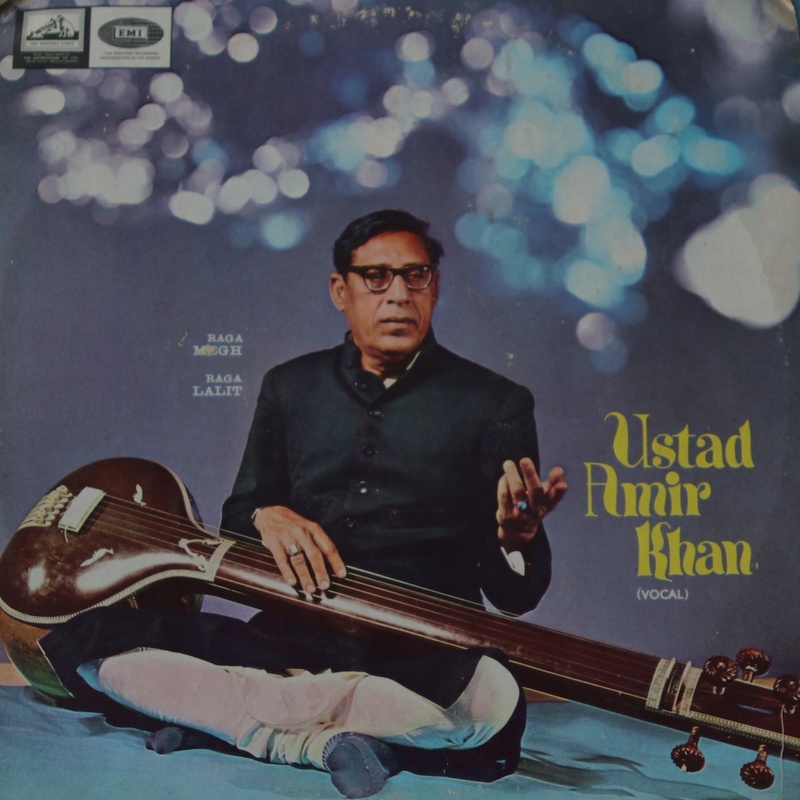 He drew inspiration from Ustad Aman Ali Khan of Bhendibazar too and in course of time, through arduous riyaz, he developed a unique gayaki bearing his own exclusive stamp. The sum-total of influences and impressions filtered through his highly sensitized being, and in perfect accord with the natural quality of his voice and his aesthetic individuality, gave birth to a style that was a rare combination of spirituality, technique, cerebration, serenity and emotion. All this he presented with an understated elegance, reverence, restrained passion and an utter lack of showmanship that both moved and awed listeners. The dominant element in his music was the Merukhand system of Raga progression, inspired and influenced by Ustad Abdul Waheed Khan when he was around 25-30. Merukhand did not remain a mere technique but became a vehicle of expression for him. Amir Khan`s singing struck a perfect balance between the easy paced and highly evocative vistars on one hand and very difficult and speedy taan-sargams on the other. He wrote and set to tune several khayals and composed a number of taranas. In the emotional content of his sargams, Amir Khan leaned heavily towards Abdul Karim Khan and shared with him a close relationship. 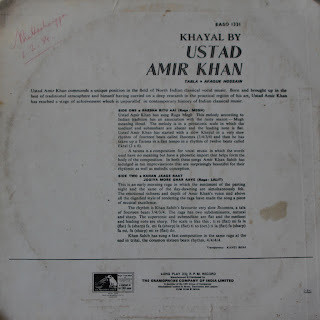 In Khayal singing, Amir Khan drew voluminously from Aman Ali Khan`s sargams. His taranas were deeply influenced by the spirituality of Hazrat Amir Khusrau. 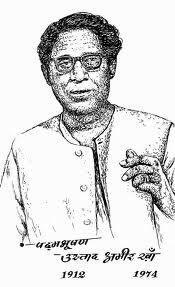 Ustad Amir Khan`s musical idiom and intention changed in the course of his life. Unlike other gharanedar musicians he was open to new ideas and re-invented his vocalism in the latter part of his musical career. The influence of the Kirana maestro Ustad Abdul Waheed Khan is predominant in his early recordings of Marwa, Malkauns, etc. In the later phase of his career, the expansion of the Raga almost always employed the lower octave phrases as complimentary to the progression in the normal scale. This was a distinct departure from all other Ustads and Pandits of the other gharanas including Kirana. Amir Khan was known as the emperor of Khayal and never sang Thumri in his concerts. But his rendition of Khamaj Thumri in the famous film `Khsudita Pashaan` mesmerized everyone at the intensity of emotion he could create in this genre also. He was awarded the Padma Bhushan and the Sangeet Natak Akademi award by the President of India. His disciples included the likes of Pandit Amarnath, Prodyumna Mukherjee, Kankana Banerjee, Shrikant Bakre, Shankar Mazumdar etc. and many more vocalists all over the country who were deeply influenced by his style and were virtually blind followers of his gayaki. Hi - Thanks so much for your wonderful blog! Unfortunately, the link here has expired. Could you re-upload please?